This isn’t a “Dear Laurel” exactly. It’s from a dear reader, though. First of all, Karen has waxed poetic about my products. So sweet and appreciated. She has all three of them and has said that she couldn’t decorate her home without them. Cool. And she has been writing me sporadically for the last several months; keeping me abreast of her dining decorating. Each time, her dining room just keeps getting better and better. Obviously, as you will see in a sec, Karen is blessed with a talent all her own. Just beautiful. However, after sending me the last set of dining room photos, she admitted that she’s not totally feeling it with the family room. So, I told her to send me some more photos and with her kind permission, am sharing all with you today. First some shots of the dining room before we get to the family room. I had shown these gorge blue and white Chinoiserie lamps a while back. And guess what? Karen bought them! I forgot the story about the mirror (I think it was inherited?) but I love it! In this case, since it’s such a statement piece, I wouldn’t put anything above it. Then, a few weeks later, Karen asked me what I thought of these rattan chairs for the host chairs. I think that Chica, Karen’s adorable rescue doggie agrees. I wonder what happened to the arm chairs? I couldn’t find Karen’s exact table from Stanley but I found another beauty from Stanley which is only $1,059.00 at Wayfair. And then just yesterday, Karen sent me the photos for the new drapes she’s been waiting weeks for. Kind of smashing, don’t you think? It’s Benjamin Moore Pale Avocado which is one of the Laurel Home Essential Paint Colors/Palettes and Home furnishing collection colors. And the color of my kitchen. The one that hopefully will get fixed up one day. I found the fabric at Etsy Studio which has tons of gorgeous fabrics at moderate prices. First some rooms that Karen is inspired by. Me too! But she bemoaned that she’s struggling to do this maximalist look without it looking horrible. Oh wow, just had to add what Eddie did to this secretary. LOVE it! It reminds me of one in this post about home offices. Here’s what Karen has done in family room so far. A few months ago she sent me this of the brand new sectional. And oh. the wall behind it. Fireplace and cabinet were on the way out. As in gone. The fabric is Crypton is Spring Grass from Robert Allen. Love the beautiful cabinet with the inside paint green. It is probably a Laurel Home paint color. My guess would be Benjamin Moore Herb Garden. Yesterday the window treatments came. I like the fabric but wish that they were inside mount Roman Shades. I told Karen that I hope that didn’t make her feel badly. It’s just my preference. And also what looks strong in a photo might not in the room and in the room is what matters. She loves them and so I’m good. However, they are making a strong statement and so I think that we need to create a better balance. Karen rolled up the rug because she’s not loving it. I don’t mind it but I think that we can do better. In any case, it’s too small. At the very least, I would layer it with a seagrass rug. I told Karen that I needed to see some more shots of what was missing in the family room. The slipcovered wing chair is going bye-bye one day. Karen kept the cherry cabinets in the kitchen for a variety of reasons but updated the counters, hardware and backsplash for a fresh updated look. Me like. And looking back from the kitchen tells the entire story. Now, the valances feel more balanced, but the room is still missing some cohesion. Nothing horrible, but I think that we can make it better. I love the rattan chair and I think Karen found a chartreuse geometric that she’s going to use to recover the cushions. But, I’m not totally crazy with where the chair is. It feels a little lonely over there. I’d like to center that pretty table and then flank it with the two dining room arm chairs. They can be brought back in to the dining room if necessary. And then I’d like to reupholster all of the chairs. First I looked at this fabric. The iconic document print Citrus garden by Schumacher. It retails for at least $200/yard! Okay, chair seats would only be a few yards. I did find this fabulous chair to give you and idea. I wish the image was better. But, then I found this charming Chinoiserie print from Robert Allen for 16 bucks a yard! French chair in the chinoiserie fabric. I could see this fabric working in both rooms and it would look fab for the dining room chair seats. I was thinking that if we did the less expensive fabric that it would be awesome to do a skirt on the chair something like this. You may call it transitional, but I can’t bring myself to do it. Can we please come up with a better word!?! Karen wants an opium/ming/Asian coffee table for the family room and I love that idea too! This one is the right idea from Ethan Allen. I have seen this table in person and it is very pretty. My only hesitation is that the “aged” appearance isn’t very believable. But, in a few more years, it will be. haha. It is almost 38″ wide, so just need to check that it’s not too big for the allotted space. I adore this little club chair which is super comfy Belgian chair in soleil linen from Serena and Lily. It can be customized in dozens of fabrics. I love this persimmon linen. Now, I don’t have a floor plan and photos can be deceiving. 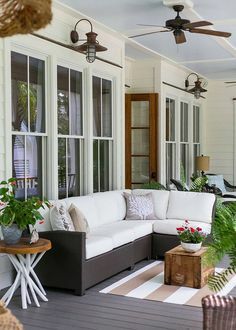 But what I’m thinking is that it might be wonderful to bring the wicker chair over to where the white slipcover chair is and the persimmon one on an angle to make a better conversational grouping. It looks like there’s plenty of room to do this. (I hope). We can also give it a pillow. I have some more ideas for pillows and little tables in the family room board below. Yes, I know. I can’t count. lol Sorry #10. It was an accident. The other day, I found a half-eaten soupy quart of ice-cream in the kitchen cupboard. Then, I would maybe round it out with a big fiddle leaf fig tree between the cabinet and occasional chair. Well, I’m sure that there’s more. But I think the addition of some of these things will take this room up to the next level or three. The exterior Karen’s house. Not the worst color I’ve ever seen, but nothing special either. It is looking so fresh and updated and it also looks like it goes with the interiors far better. That’s important. I forgot to mention that all of the interior cream-colored walls are Benjamin Moore Linen White which of course, is another color in my curated paint collection. For those that don’t know. 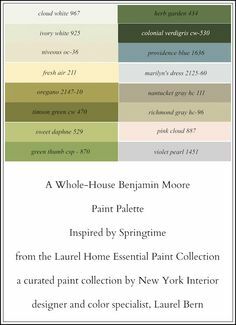 There are 144 Benjamin Moore colors. I think I have some exciting news, but just need to make sure. It’s about a trip. To England! More about that soon! Is it me or are you on vacation? You haven’t popped up in my email, so I resubscribed. I hope it was my snafu and not your blog having a problem? Oh, that’s odd. Sorry for any problems. And no, I am not on vacay. I’d check on it, but since you’re back in, I can’t see what happened. Someone last week unsubscribed and sent it to spam and has no recollection and felt horrible about it. Love your blog and read each and every word! May I suggest that the homeowner consider adding a valance on her kitchen window? The key would be to hang it high and create an optical illusion of a taller window for visual balance. Perhaps in one of the fabrics (like the Robert Allen) that you suggested? Would she consider having her kitchen barstools painted in the warm white? And add a thin cushion (with a short skirt) of the same fabric as the kitchen window valance to the painted barstools? Didn’t you get the memo Jan? You need to read all 97 comments before replying. lol Seriously joking. But that has already come up and actually the valance is coming any day now. This room gives me hope that I will be able to pin down great ideas for my dining room…..You rooms are evolving so beautifully. Definitely 20/80 in that 20 per cent of choices and items in the room are giving 80 percent of WOW. But perhaps I missed it or maybe it will be there, where are you going to put more navy blue so the valances can relate to something? Or do they need to not relate, like the Blue and White export ware can stand alone in a room with no blue? Or maybe the Chinese Garden Stool will be enough….curious? Karen has a lovely home and it is great to see she has used one of your paint palettes. The dining room curtains are so pretty. That Jaclyn Smith material and the chinoiserie are sold at Calico Corners. I mention just in case that is a convenient source. The Etsy shop in the link – the price quoted is great and it is for a 1/2 yard, not a yard, no fainting! Thanks so much for your always fabulous comments. I was wondering about that too with the Etsy shop, but when I looked more closely can see that it sells in half yard increments. One can buy a whole yard or 50 yards of the fabric. (assuming they have that much to sell). What a fantastic job Karen did so far!! Affirmative all. I just think the rug needs a larger seagrass rug layered because the other one is too small. You can def mix all sorts of blues. As Barbara Barry says, “Complexity is what makes rooms rich.” So true! Laurel I have trouble with the rug size because of the tight flow to the kitchen and because you have to walk past the media cabinet to get to that outside door. Then there are the heat registers that take away precious inches. And is it okay to encroach into that bay window area I wouldn’t know how big of a seagrass rug I’d need. If I do a larger seagrass could I use a smaller rug for under the ming coffee table? One other thing, all the seagrass samples I have ordered MATCH my flooring so closely. That made me wonder if it was worth doing at all. I found the Ming table (31x49x18) at Bellacor, the lighting company. It’s teak but I will chalk paint it, distress it a little to let the teak reveal itself a tad, then wax it. It was $300 so don’t know about the quality, but the dimensions were the best I could find. Oh, I wish I could answer those specific questions about the floor covering, but that’s the brain surgery of this business. My best rec is to draw it out. If you get some graph paper it is easy. Just use a ruler and 1/4″ = one foot. It doesn’t have to be precise down to the last inch, but close. The sea grass should be lighter/greener than your floors and it’s also a completely different texture and that’s what’s so great about them. Lovely thoughtful post. As I’m currently trying to decide on exterior house colors, I paid attention to the picture of the white exterior paint. I think it looks classic and lovely However, I currently have white trim and it constantly looks dirty. I would like to paint in a navy with white trim or a gray with white trim but the dust and dirtiness that’s I see drives me crazy. PS I have a craftsman bungalow built in the 1920’s and I live in Tampa Florida. Your blog is the perfect combination of wisdom, wit, and helpfulness. I appreciate you! This may be my favorite post yet- is it possible to get “after” pictures of this lovely home? This is a wonderful article. 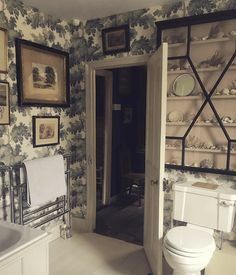 I love seeing these beautiful rooms and the progress it each. You mentioned that Linen White is on the walls. Do you know if the trim is also in Linen White. It looks so fresh! Well, I don’t disagree, but the problem is that there’s the living room and the stair well and then the hall. The decision was made to paint it all one color because it’s difficult to find a good beginning and ending point. Fun and informative post, as always! I would love to know who makes the semi flush light fixtures with the single crystal drop- could you find out? About the Robert Allen chinoiserie; it’s fun and super-affordable, but it’s also everywhere. I wouldn’t be surprised to see it on Target furniture any day now. 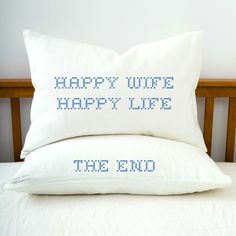 We have 2 large, custom pillows in that fabric on our LR sofa, so I have to laugh (I’ve always said I have the “common” touch)! Well, you may see that fabric everywhere because you’re in the biz. That sort of thing never bothered me. If I love something, I love it no matter. But I also know what you mean. One reason it’s so reasonably priced is because they produce a lot of it. Everything you’ve suggested as ‘tweaks’ is just beautiful, and I want to congratulate Karen on making her home look so friendly, happy and lovely! You are so generous and thoughtful with your expertise and your suggestions, which are both beautiful and practical. Amazing. And your paint collection and Rolodex are treasures! Thank you for sharing your awesome talents, chief among them your sense of humor, which I’ve found to be 100% lifesaving during a long ongoing whole house gut renovation, which included a designer I adored as a human being (and paid oodles and oodles of money) who hadn’t completed the work she promised–like lighting, hard goods, rugs, mirrors, completed paint palette, hardware, bedding, select upholstered items and more–long (as in a year) after she was paid a big fixed fee. (I paid her hourly, too. She complained that she wasn’t making enough money on my job. I should have bought a lake house with that sum of money instead.) When I told her again and for real that I really needed her to deliver, as construction was nearly complete, she quit. Oh, she also doubled the prices of fabrics she recommended and we selected, and tried to obscure the brands (“to protect her vendors”) by ripping the labels off samples. There’s so much more (like not returning funds advanced to her to pay for furnishings) but I don’t want to ruin your breakfast. Sigh. What can we do? Thank you, thank you for such a glowing testimonial. About the designer. That’s shameful behavior on her part. Not making excuses because it’s designers like her who give the rest of us a bad name. But it sounds like she has a high over-head and a poorly managed business. And/or, she’s really not fond of taking care of the details as they are not as lucrative as the big ticket items. But no matter; she promised and then insulted you on top of it. With ordering a rug online, I would make sure that it’s returnable first of all. Also, sometimes you can contact the vendor and they can take the rug outside for more photos. Also, I read reviews. But not everything has a review and some pieces are one-of-a-kind. Thanks for the amazing help Laurel! I could not have gotten this far without your fabulous products. All I did was settle on your Spring Palette. One of the smartest things I did was to first have the paint product professionally bound for easy reference. The green inside my media cabinet is indeed from the palette, Oregano. In the dining room I call the Stanley sideboard “Marilyn’s Dress”. The “Pale Avocado” sectional was made up in Robert Allen Crypton (which I never knew even existed until I read your post about this wonder fabric) and boy does that hold up to a family and doggie. One thing I’ve learned is to forgive myself for “mistakes” and never to take myself too seriously. I think it also has helped to drop one thing in at a time and then take pics and see what comes next. Wow! I love how the white transformed the outside! Just beautiful! Love love your chinoiserie fabric choice for the chairs and the rug is great. Centering the table with flanking chairs under the window is perfect, and switching out the chairs in the living room is such a great idea! Definite Yes on the coffee table. The room needs some white. I’m having a hard time with the curtains, although I understand that she does like them. Beautiful dining room… and what a great wall color that plays so nicely with the sectional sofa. Anyway, what do i know, but i couldn’t resist commenting. There’s nothing wrong with your reply. It is a bit of a crap shoot. I do try to post good quality or at least acceptable for what it is. Sometimes I read reviews. I find that very helpful. Oh, I’m sorry. We can’t answer that because don’t know where the trim is or what else is going on. And if the reference is to Benjamin Moore’s “white” which is also on my list, I wouldn’t call it a pure white. In fact, it has a lot of gray in it. It is warm. I should know. My entire apartment’s trim is this color. It’s not great with the yellow; the yellow in the morning light makes the white look like a cool white. But, I generally don’t spend much time staring at my trim. haha It’s not offensive, just not what I would have chosen. I think for the windows, it would be better to have one or the other. I think it would only make the windows feel even heavier to have the bamboo shades, although I do love them. But I love them either alone or with drapes.